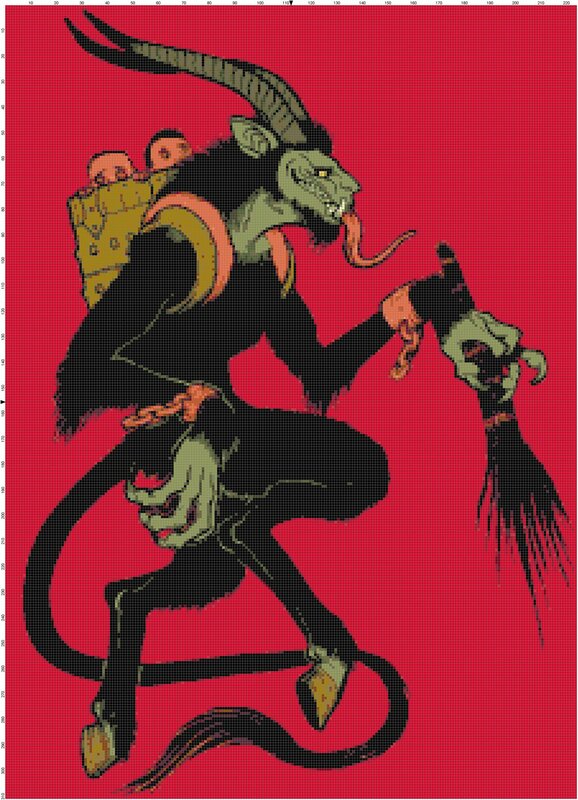 For those of you not in the know, the Krampus is a hideous anti-Santa from the old Germanic tradition. Kids misbehaving? Don’t threaten them with a boring old lump of coal; threaten them with a manacled, goat-faced demon who sneaks in at night and whips them with birch branches! Even more (hilariously) messed up, young men have been known to dress up as the Krampus on December 5th (the eve of Saint Nicholas Day on many church calendars), and roam the streets frightening children with rusty chains and bells. Krampus is featured on holiday greeting cards called Krampuskarten. This piece is 224×311 stitches, or approximately 12.5×17 inches on an 18 count fabric. Previous postFabric Blocks – the Wave of the Future!